We supply plain plastic cards NZ Wide for any purpose or business size. We also supply full colour plastic cards and card printers to help you customize the cards for your business. Our high quality white plastic plain cards are ideal if you have your own printer and wish to print your own small run identification or membership cards. Colour or mono foils are available in our consumables section for most printer types. The cards can be purchased as plain white or with an added magnetic stripe and or white signature panel (s) Plain white contactless smartcards are also available in a number of chip types. Our cards are suitable for all ISO standard ID card printer models, including Pointman TP9100 ID card printer (recommended), as well as all Zebra, CIM, and Datacard printer models which are commonly in use. To protect your printer and to minimise wastage, always keep your supply of cards in a clean dry place and protect your cards from dust and dirt at all times. We have supplied cards to beekeepers to use as bee landing platforms to help bees find their way home to their hives. This is an initiative supported by Ecardz to reduce our carbon footprint and act in an environmentally responsible way. Plastic cards CAN be used to clean ice off your windshield in winter, we just don’t recommend you use a card that you then need to use for another purpose! 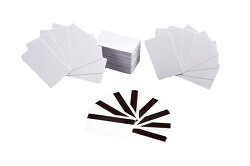 Plain cards conform to ISO Standards 7810-1995 (E) and 7810-1990 (E). The cards are made of PVC plastic and have a sheer gloss laminate overlay on both sides which allows for cardholder details to be added. In appearance the cards resemble banking cards in size and shape with rounded corners. The base stock colour is white. Ecardz can design a card for you or work from your supplied artwork to create an attractive card which represents your brand in the market. Our cards can be printed up to full colour on both sides and can include additional features such as metallic inks, foil hotstamping, magnetic stripes and signature panels if required. If you require plain plastic cards give us a call today.